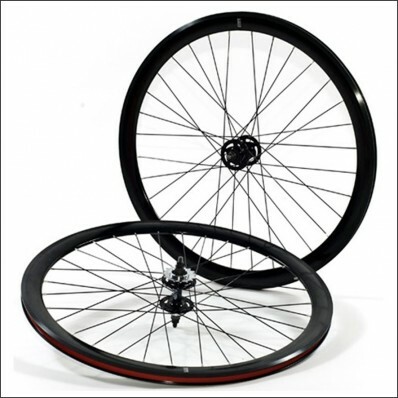 Are you looking for a fixed gear wheelset? We have the most beautiful deep rim fixed gear wheelsets that are ready to use! Available in many beautiful colors, 43mm deep-V rims front and back wheel, fixed hub with a 16T fixed cog and a high quality nylon rim strip to protect the tubes. Optional you can order a tube set and a free-wheel cog. Start customizing your own bike and choose one of these beautiful colored fixed gear wheelsets, ready to use! Warranty: 1 year manufacture warranty, damages not included. Please note, tubes and tires are NOT included. Assembly: The wheel set comes assembled (hub, spokes, and rim). Additional free wheel cog is available but needs to be ordered and installed. We recommend you assemble the wheelset with a professional. The bike will be safer and ride better when assembled and tuned properly. 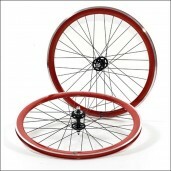 Don't wait too long, start customizing your bike with this beautiful wheelset.